We made our bus! The 0800 bus from Udon Thani to Vientiane was full, though. We woke early to eat and get to the bus terminal by 0700… And there was already a line of 20+ people at that point. No matter. The attendant made sure I already had Laos visas in our passports before giving us tickets. This is the direct bus to Vientiane. It crosses the border over the Mekong at the friendship bridge. If you don’t have a visa you can get one at the border but it takes a while, costs more, and the bus doesn’t wait for that. As it was I was rushed to fill out 3 arrival cards and ran to catch it… One guy came after me and it took off! 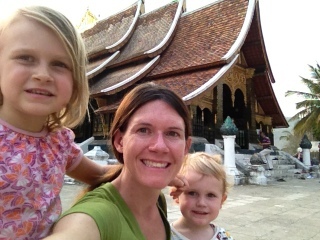 Vientiane was another half hour up the road. By this point it had been just over 2 hours and I was getting nervous that my time buffer wasn’t big enough. 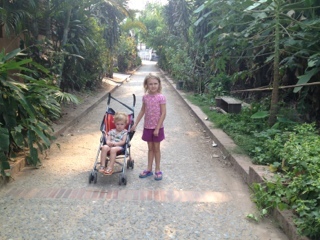 We still needed to catch a tuk tuk to the airport to catch our 11:45 flight up to Luang Prabang. 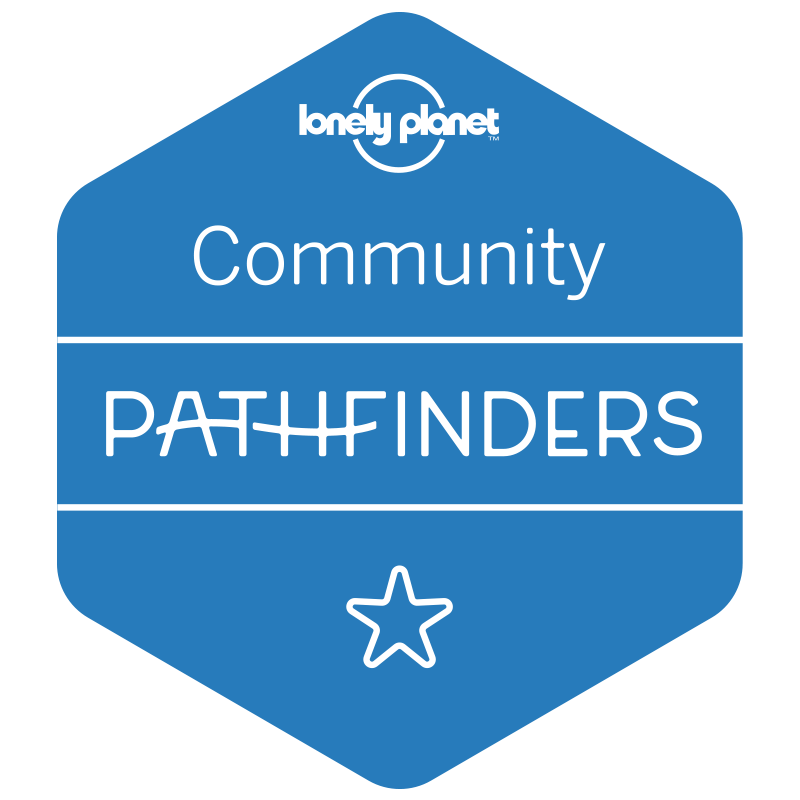 That is our destination! 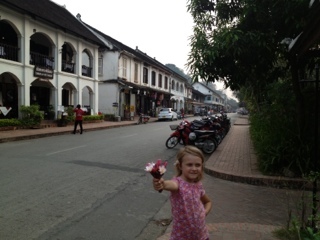 It’s a world heritage city site nestled in the Lao mountains. Drivers were yelling at us as we forbid the bus offering tuk tuk services. I picked on with good English and negotiated a rate as he followed me I grab our bag out of the bottom of the bus. 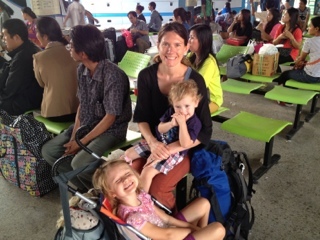 Then we were wished – well slowly driven – to the airport and checked in. 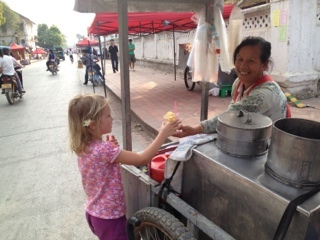 The Vientiane (this is the capital of Lao) is a small open air affair with slow lines. Its basically the size of State College airport (for my central PA followers) but without AC or all the walls By the time we checked in and went through security and a third “I don’t know what for” checkpoint we had 10 minutes to spare before boarding. Avi and I watched our bag drive by on a cart and go up into the plane. 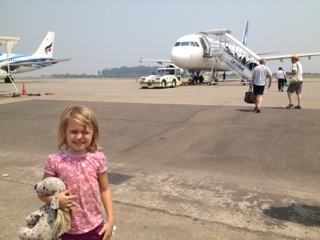 Then we walked outside and up some steps onto the jet. It was a nice fast flight! 45 minutes and some freeze dried fruit snacks later we landed. Luang Prabang is situated on the river and the old historic town takes up an island between the main river and a side stream. Our guesthouse – the Singharate – is in a nice residential area just west of the historic zone. It’s a great small place run by a family. We’ve met quite a few of them as they live to watch the kids do ‘shows’ in the courtyard. Our room is nice with great AC and teak floors. It’s an authentic, but remodeled French colonial-era place. The windows dont have glass, just iron gating with huge wooden shutters that close up tight and dark! So nice and dark we took a great nap after checking in around 1330. When we woke the family was out and about so we ventured on our own into town. From here it’s about 3km to the end of the historic town island and we walking the while way… And back. The town is super cute with an almost European flare, and fun to stroll. There is a gorgeous temple on most corners, and lots of street vendors selling fruit milkshakes and something I haven’t seen in Asia …. Baguettes!!!! Yes. French colonialism not only left a quaint town, but also good bread. Yum!! Avi loves it. Most people get sandwiches, but my kids just want plain bread. We strolled along the waterfront. The Mekong river is quite broad here with mountains rising alongside. Zoe didn’t notice she had walked so far because she kept picking up flowers. 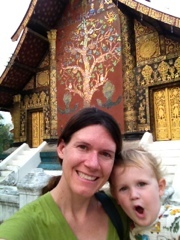 There are so many flowering trees here, like in Thailand, and she loves it!! 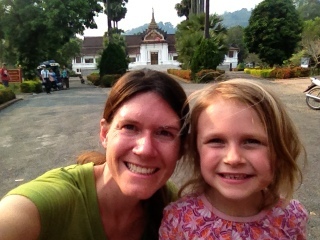 At the end of the historic district we made it to Wat Xiengthong. 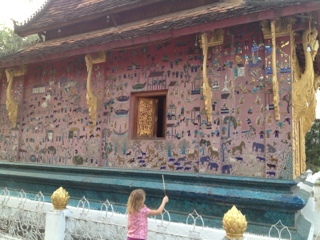 This is one of the huge attractions here; it is a beautiful old temple built in 1540. There are incredible gold paintings on the walls and intricate colorful glass-mirror mosaics on the exterior of the buildings. It was especially beautiful when we saw it because the sun was getting low and glittering on everything. It was also well past tourist hours, so we almost had the place to ourselves. 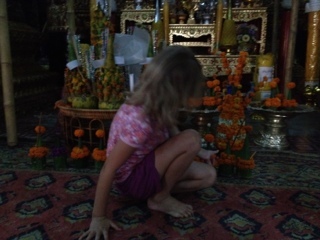 Zoe bought a special flower token to set at the Buddha. 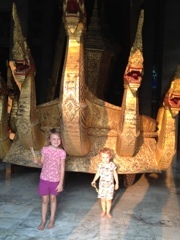 Avi loved the huge naga-serpents. As the sun set we moseyed through the cute tree lined lanes of old town. 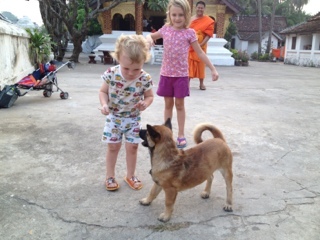 We passed another wat where a young monk was playing with a cute puppy. Both kids rans to play too. I chatted with the monk for a bit. He spoke pretty good English and said his mon lives in San Francisco. His name was Jhan and the puppy was called Thea. The kids loved Thea!! 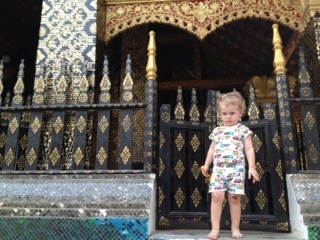 They played and squealed with him for a long time while the rest of the monks were in the temple chanting. When they were done they came out to see all the ruckus and thought both kids were funny. 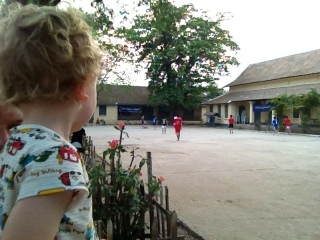 A bit further down the road we passed the local schoolyard where a bunch of boys were playing football (soccer). Avi had to stop and watch… And even cheered them on. From there it wasn’t far to the night market. It was hopping! It was also very fun to see all the near handicrafts and silver jewelry (this was a famous silver producing area in the past). Many of the craft items reminded me of things the local villagers would sell in Chiang Mai. 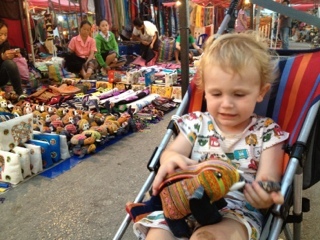 Avi ogled some stuffed elephants, and has asked for them before, so I let him pick one out. He has been singing with it in his stroller ever since. Zoe was allowed to get a small peacock compact mirror. She simply loves all the sparkly jewelry and anything bunny-shaped. we even stopped to pet the cutest scruffiest orange and white kitten ever. The animals around here are certainly not indoor pets as we would have, but they are fed and treated well. Not the strays and feral cats we see in Korea. 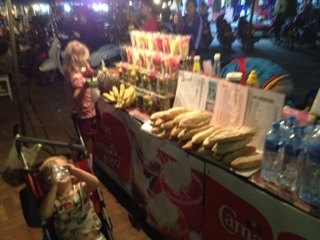 On the way back to our guesthouse we picked up a few sandwiches, some fried dumplings, and drinks. A few ladies gave me some boiled eggs too, and pointed to the kids. It’s so interesting to me what people in different cultures find to be “kid food”. Back at the guesthouse we sat at the tables out front and tried to eat dinner. The guesthouse family was back, though, and enjoyed it with us (and with my parents on Skype). The eggs….ugh… were barely soft boiled. I wondered why we needed a spoon. Those didn’t get eaten I hate to say, but we appreciated the thought. The fam had fun playing with Zoe and Avi and a stuffed bear he pushed around in the stroller. Now we are in our room watching Tom and Jerry and finishing the dinner that didn’t get eaten.